Welcome to Part Two of my Cinque Terrie series. 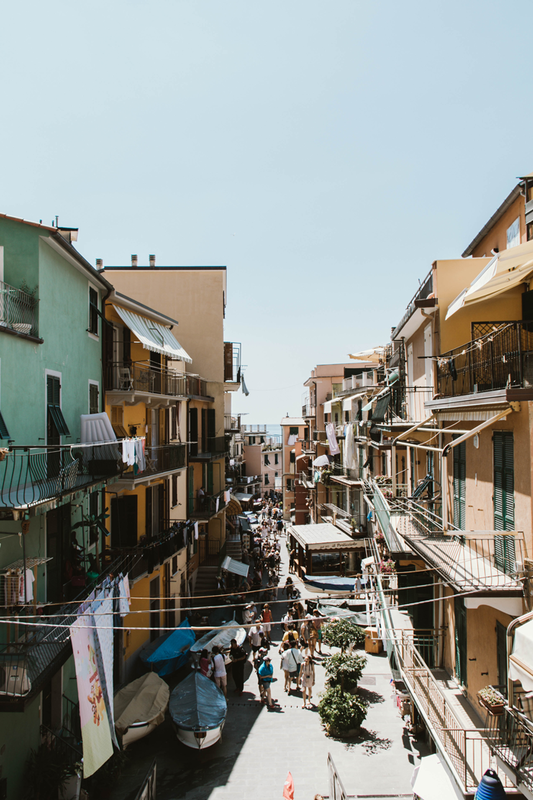 If you have missed my blog post to Riomaggiore, take a look here. For those not in the know, Cinque Terre consists of five picturesque towns that are nestled along the Ligurian coastline. 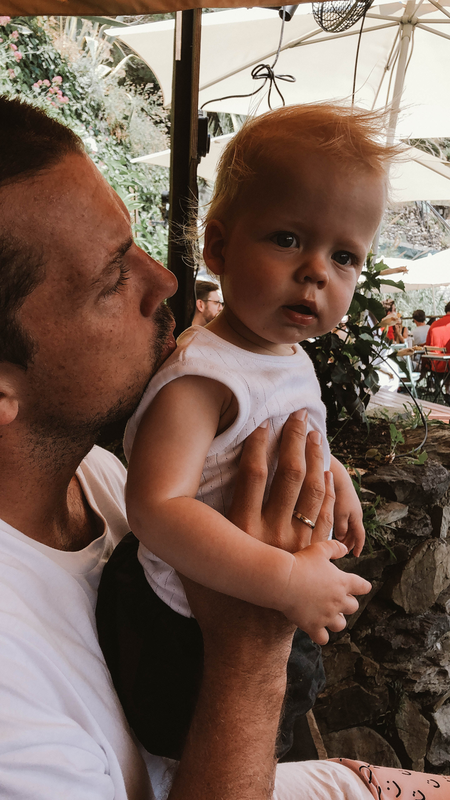 Life along the Cinque Terre is all about slow living; you wake up late, enjoy an espresso for breakfast, choose a town to spend a day by the beach, and enjoy a meal of local fresh fish, pasta and wine at sunset. On repeat. Manarola is one of the five towns and it also is the second smallest. If you aren’t staying here, it’s the perfect destination for a day trip from any of the other towns, as well as La Spezia. If you want to find out how to get to Manarola and the other towns in Cinque Terre, keep an eye out for my full travel guide to Cinque Terre, which will be posted in a few weeks! I’ll share the link here when it goes live. As with the other towns, there are plenty of places to stay. Ranging from less expensive to high end, there’s a great mix of hotels and Airbnb properties. As we didn’t stay here, I don’t personally have any recommendations but I am all for staying at an Airbnb so here’s a link for you to start searching. Anything with ocean views would be incredible but that also means it’ll be located further away from the train station. To be honest, it’s a small town, so the walk to any Airbnb will be certainly fine. 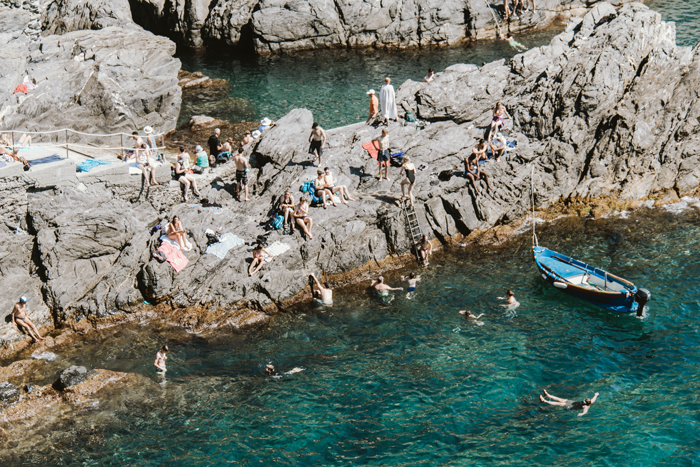 For most people, Manarola is a day trip destination - unless you are lucky to spend a night or two there. We stopped into this town in the mid morning and stayed till the early afternoon, so I can tell you where we ate lunch. And I highly recommend eating here - Nessun Dorma. We actually stumbled across this stunning cliff facing restaurant by accident and luckily got a table. When we sat down, I recognised this as I’ve seen a lot of influencers take photos at this very spot. Getting a table cliff side is no easy feat and with a baby, we chose not to wait. But we got an amazing table and were very happy with the outcome. The food was spectacular and so too were the cocktails. If you’re visiting in the warmer months, bring your swimsuit and towels. 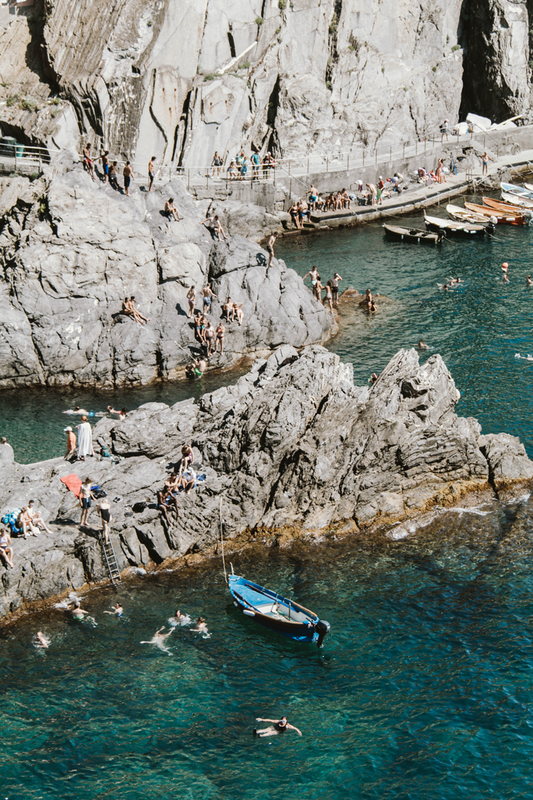 Perching yourself on the many seaside rocks is a must in Manarola and it’s very popular for rock jumping. 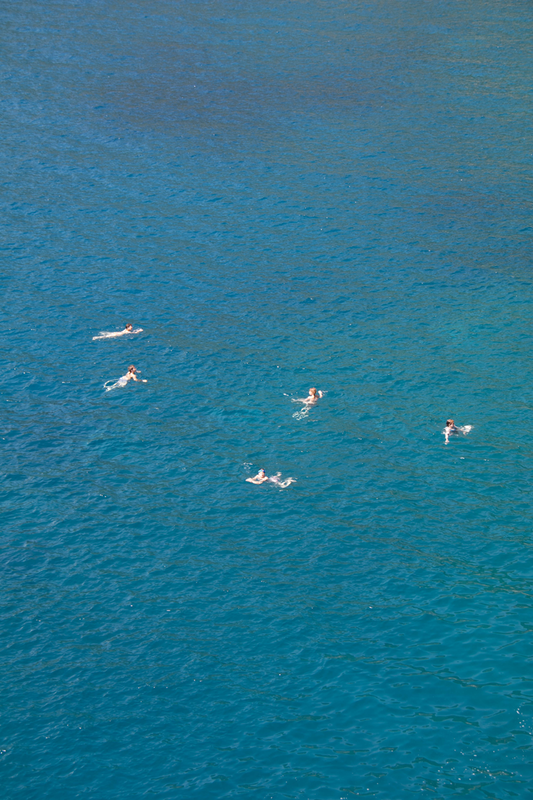 Just be careful, we saw many, many inconsiderate people jumping into the water and landing on unsuspecting swimmers in the water. Honestly, it was idiotic. So be careful! Definitely take the coastal paths and just keep walking and exploring. Don’t get hung up on maps here - the beautiful thing about Manarola is that getting lost or not having a general destination in mind will mean you stumble across some beautiful vistas. When you get off the train, you have to make your way down the Main Street and here you will find a plethora of cafes, shops and restaurants. If you want to stock up on some Italian touristy trinkets, there are plenty of places to do so here. If you want to see Manarola (and the other towns) from the water, you can hire a boat down at the foreshore. We didn’t do this ourselves so you may have to do a bit of research to find out what options are available. Stepping off the train and walking down the Main Street of Manarola. Like moths to a flame, walking straight to the ocean. Waiting for our meal at Nessun Dorma. After lots of selfies and photos, it was nice to see everyone enjoy the view and food. We never got sick of this view. Pinks and greens, the colours of Manarola. Those postcard views, molto bene! A photos from the 1970s, or the 2010’s? Plenty of rocks to lay on, and jump off! Could not photograph this view enough!